is quirkily presented in fire extinguisher-style packaging. Firestarter Vodka is a premium 40% Vodka from Moldova which is not only fun but with great quality to match. The Vodka has been 5 times filtered with platinum to ensure an extremely pure and smooth Vodka. Distilled using ‘Moldovan winter wheat’ from the central regions including Chisinau & Dubasari. During the final distilation the Vodka is infused with honey to give body and richness. 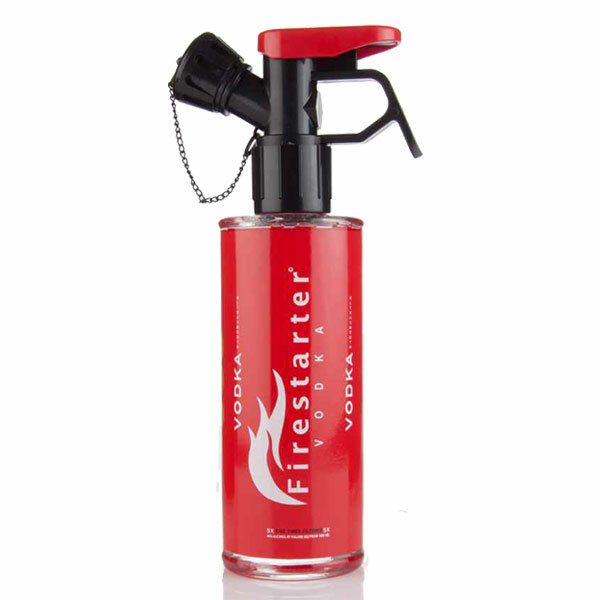 Firestarter Vodka is crystal clear and the nose is invitingly fresh with a generous dose of sweet grains with an accent of wet rivers stones and hints of spring flowers. The palate confirms the nose being silky with a dose of sweetness that is expected with wheat based Vodkas. Nicely balanced with great texture ready to act as a solo performer or perfect for citrus mixers that will take advantage of the citrus notes that rise on the finish of this Vodka. Firestarter Vodka is from the proud Moldovan distillers who continue to perfect their trade and consolidate their outstanding reputation as the world’s vodka expert.